Eppendorf tubes were incubated on a shaker in a 37°C water bath for 10 minutes, 15 minutes , 30 minutes, 45 minutes, 1 hour, 1.5 hours, and 2 hours for one of the fiber tubes and one of the blanks. 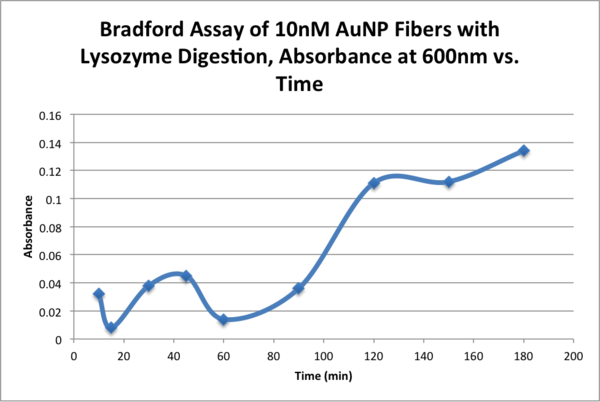 The graph below shows the peak for the absorbance at 600 nm. 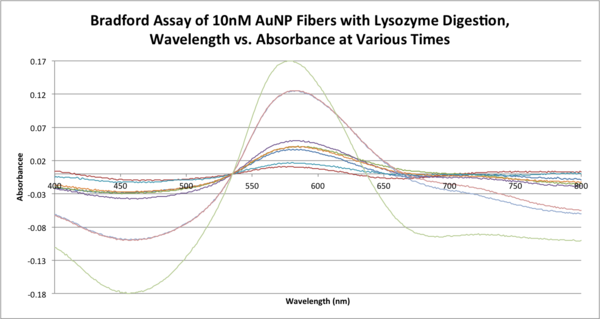 For the first 90 minutes the absorbance is realtively stable at around 0.04 with dips at 15 minutes and 60 minutes. It is unknown if these dips are due to peptide concentration or human error. The absorbance then increases after 60 minutes. It would be desired to take additional samples past two hours to see how the additional time would affect the data.